Zostel Manali v Manali, Indie: Zarezervujte nyní! 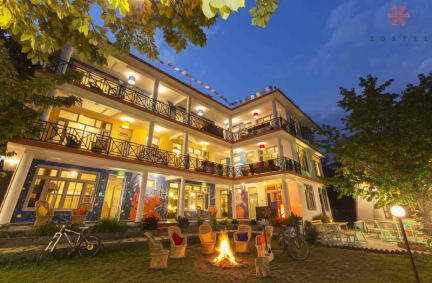 Zostel Manali is located right in the heart of Old Manali, the hub of backpackers. In search of peace and breathtaking views of the mountains, we went off-road and built the hostel in the village of Old Manali. The hostel also houses The Garden Café, which serves authentic Himachali food. Our friendly local staff can help you explore more of manali and its culture. Manali calls out to the adventure and mountain lovers alike.Proud of offering something for everybody, Manali is an old favourite among backpackers and tourists alike. The adventure activities including snowboarding, trekking, and paragliding can be arranged for the guests.